I rarely stray away from the topic of food... But truth be told, this is actually not too far from "Food".. If, of course, you have an appetite for human hearts and other internal organs. I wanted to share with you some of the work that the company I work for has been doing over the past few months. Something that we're all very proud of, and we hope this movie will make a mark in Philippine Cinema.. Yes, I know what you're thinking. The Aswang story has been done over and over again for the past few years, right? No argument there. So what makes this different from last years' "Aswang" (also Starring Lovi Poe) and "Corazon: Ang Unang Aswang" (With Derek Ramsay and Erich Gonzales)? Admittedly, there's nothing truly ground breaking about the story, although you're undoubtedly in for a thrilling roller coaster ride of horror, infused with a little comedy (The presence of Ramon Bautista made sure of that). In a nutshell, It's a simple story of Makoy, (Dingdong Dantes) that goes after his girl Sonia (Lovi Poe), and manages to piss off a community of Aswangs in the process, so now they want his girl's unborn child. So now its up to Makoy to save his family. Director Erik Matti takes that simple story, and decides that shooting in an isolated house in the middle of a desolate province just won't work for him. Hell no. He realizes that the cost of the location, and coordinating all his artists schedules for out of town shoots would be astronomical. So what does he do? Taking a cue from movies such as "300", the (insane?) visionary director decides to shoot everything.. and i mean EVERYTHING against a green screen set. Meaning they locked themselves in a warehouse for a good two months or so. Forests, mountain ranges, villages.. you name it. 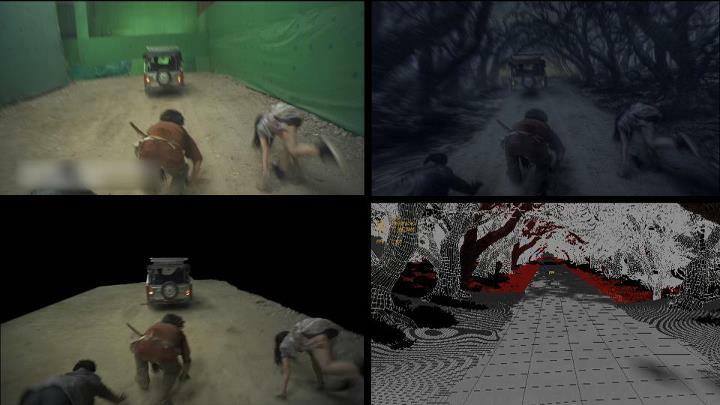 ALL the backdrops were matte painted into the scenes in post production, with actual sets and props being constructed to help add to the realism. 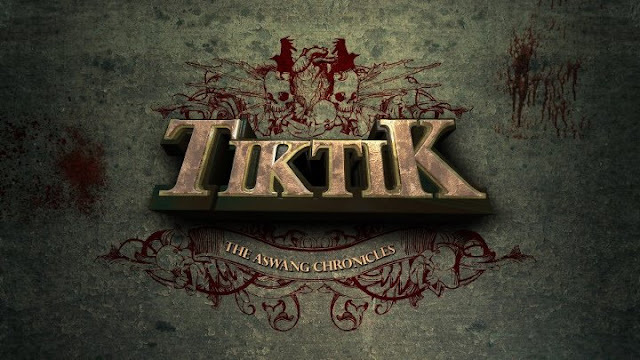 Not to mention Erik Matti found a leading actor who shared his vision for "Tiktik". Not only did Dingdong Dantes enthusiastically come on board as the volatile "Makoy", but Dantes' production company Agostodos Pictures served as the film's co-producer. To my knowledge, this is the FIRST Filipino film to do this process in its entirety. We may not be Hollywood caliber just yet, but I believe that this is a huge step in the right direction! Bottom Left: The background is "keyed out"
Top Right: "Keyed out" material is composited into the 3D Backgrounds. IS SHOWING ON OCTOBER 17! i have a showbiz blog will write about it.. and tweet you pag naka up na..
That would be awesome, Leira, thank you so much! I'll let you know if when the promo group has an event or something bloggers! Don't worry BW.. there are still A LOT of Money shots they haven't shown yet! Will let ya know, bro!! hi! been visiting your blogsite for months. i think i'll be watching this film coz I like both Dingdong Dantes and Lovi Poe. more power! i'm no horror film fanatic too but this is very good for a local production effects. i mean, i agree not really yet the hollywood quality but it's a big leap. Just found out about this movie and it looks good. Will it be playing in any U.S. Theatres? can't wait to watch! super cool.. i have watched aswang where lovi poe was the lead, ngayon i'l be watching this one again.. she's a horror princess! :) plus dingdong dantes ! cool..